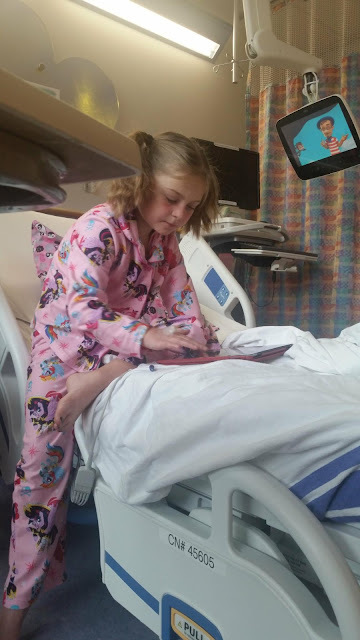 Once we got moved to a room yesterday Olivia was able to relax and try to pass the time. Nothing eventful happened. She had a seriously itchy IV. She couldn't stop obsessing about it, talking about it, saying it hurts. We would distract her for awhile but it would always come back to it. We got tons of positive thoughts and prayers from everyone yesterday. We really appreciated it. Coworkers, olivia's school friends, parents, family everybody was keeping our girl safe. Once Melanie left to go back to ronald mcdonald house, Olivia continued with a little crying here and there over her IV. She finally fell asleep but tossed and turned. She'd sit up and cry about her IV every now and then. At 2am I told the nurse she had to do something benadryl, change the tape, something. She changed the tape and then it was the burn from the alcohol wipe. Once we got past that I laid in bed with her and I fell asleep, I think she did too. This morning she told melanie I slept all night and she woke up with the nurse a few times. Nevermind all our activities till 2am. The night nurse never gets any credit. It's always about the day nurse. Hopefully we'll get discharged before lunch time and we can do some fun things in Philly tonight. I'll update you guys as soon as they take out this IV and discharge her. Thanks again for all the thoughts and prayers. Hopefully it'll be another 4 years or more till her next cath.